At Riley Manufacturing we pride ourselves on providing superior sporting goods products that are designed with safety in mind. We constantly strive to build a strong and lasting sports product. If it does not meet this specification, then it simply does not get built. Through a tradition of innovation, we have been creating safer sports environments for over 35 years. Since our initial invention of the magnetic release Megg-Net™ System and the redesigned NHL approved ice hockey goal frame, we have continued to invent and bring to market many new and patented products, each built to help reduce threat of injury. We are pleased to offer the new NHL regulation hockey goal frames which are changing for the 2013/2014 season. 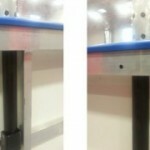 Since our entry into the manufacture and installation of dasher board and sports containment systems, we have introduced two new exciting products to the world of hockey; the FlushMount™ Shield System and our latest invention, the FlexPost™, were both created to help reduce injuries to players. FlushMount™ removes the ledge which has caused many serious injuries, while the FlexPost™ could help to mitigate the risk of concussion and other traumas. Hockey is not the only sport we are working hard to try and make safer. Our baseball and softball system, the MagBase™ SuperBase system, when installed correctly, is designed to disengage on impact from an improper or fast slide. You’ll find information on all of these products and more throughout the site. You can also download a full catalogue of our products here. This revolutionary new product provides an inexpensive way which could help reduce injuries often caused by hits to the ledge on the ice side. 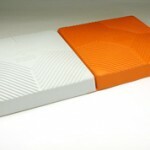 Available with curved or straight shielding. Can be used with Tempered Glass or Acrylic Shielding. FlexPost™ is a revolutionary new concept, combining the rigidity of an aluminum glass support with the strength and flexibility of a reinforced, state of the art, hot cured polyurethane. 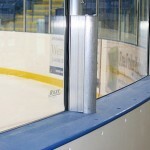 When a player hits the glass the support allows the glass to move away from the impact zone, which could help to alleviate the threat of a concussion or injury to the body. The result is that IT WORKS. A simple concept, but so effective. FlexPost™ is available as both a standard support and a Flush Mount support. Riley Manufacturing’s MagBase System is a rubber moulded magnetic release fixture designed to hold the SuperBase securely in position while players are running over or pushing off of the base. A player sliding heavily into the base however can create sufficient force to dislodge the base from the magnetic fixture. The impact is thereby absorbed and the risk of serious injury is reduced. Riley Manufacturing’s dasher boards are manufactured from start to finish in our own facility. We offer the best quality and value in the industry. We will produce a dasher board system that suits our customers needs, whether it’s steel or aluminum, permanent or conversion friendly. We can build it how you want it!